Rest assured I am still here and working on getting my blog back. Thank you for all your suggestions. I did go back through my archive and reluctantly delete many hundreds of posts in an attempt to lower my data storage levels, but alas it remains at 1GB. Continuing to resolve the problems. Oh Dear! Blogger now tells me that my blog is to full, and I have used up my allowed space for storage. All options refer me to a site which requires me to pay in US Dollars. Doesn't seem to like my English Pounds. Happy Thanksgiving! I'm still making valliant attempts to use up my prize winning giant pumpkin before it rots away. I must admit, more than half has already gone on the compost heap, it is just too big to deal with and isn't doing well indoors. Leo is doing his best to help the process along.. if you look carefully at the right hand point of the pumpkin (click on the picture to enlarge) you will see some suspicious 'nibbling' type marks!!! Thanks for helping Leo! So pounds and pounds of pumpkin chunks were laid out on the shelves of the dehydrator. And just 24 hours later they had almost disappeared to little dry pumpkin chips. Just goes to show just how much water there is in this type of giant pumpkin. So I may find a use for these little pumpkin chips over the next few months? in soups, stews, muffins, curry?? who knows. I might just put this jar of dried pumpkin chips in the freezer and they will last a bit longer. I splashed out on some brand new rasberry canes this week! My last raspberry patch was just getting less productive every year, so after 6 years I decided to dig them all up and start again. A lovely selection of canes recommended by the RHS are Tulameen - a large Summer fruiting variety with the most amazing taste. Tadmor, an Autumn fruiting variety. Erica is an interesting new variety, says it is mainly Autumn fruiting, but if you leave the canes till the following Spring they will fruit on those as well! I will have to figure out when to prune them, but they sound interesting. I thought I would try some mycorhizal fungi to help the root systems develop. A beneficial fungi for the soil which enables excellent root development and uptake of nutrients from the soil. So a spoonful in each planting hole making sure it comes into direct contact with the roots. Has anyone used this? Does it work? So an extra helping of compost, well rotted manure and a good watering in and these should be happy. 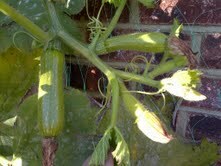 This climbing courgette Black Forest is against a South Facing brick shed. Seems to have protected it from the night time frosts. First time I've had courgettes in November! What to do with still heaps more giant pumpkin? I made some spiced Pumpkin Chutney today. Closely supervised by my lovely kitchen assistant. One secret ingredient is the Gluhwein or Mulled Wine to replace some of the vinegar. And quite a few Christmas spices, including a bag of dried mixed berries.